To increase plant productivity in blown film extrusion, German company Kreyenborg has equipped Hosokawa Alpine’s plants with its K-SWE continuous screen changers. The screen changers were provided with a separate control to allow a smooth filter change during operation. The retrofit eliminates production line shutdowns during filter change and improves the filtration result, aiming at an increase in plant availability and productivity. The K-SWE screen changer is said to be a modern filtration system that enables the exchange of the mesh without interrupting the production. This means the system can continue running while dirty filter elements are replaced or filtration finenesses for different production batches are changed. The result is an increased production capacity together with an improved filtration performance, which is reflected in the quality of the produced film. 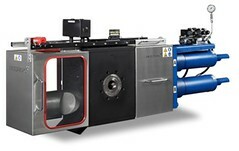 The end user is very satisfied with the short payback period of the new screen changer and thinks about more investments in the filtration technique of its blown film lines for the future.